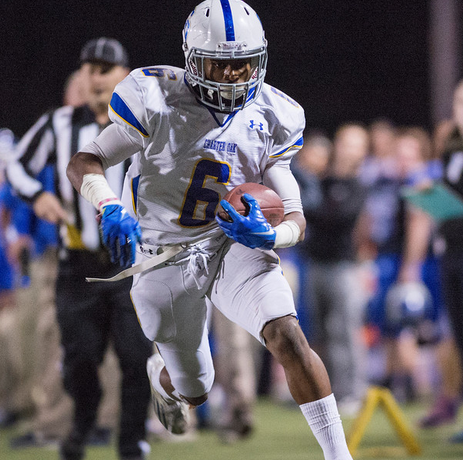 Charter Oak’s Zion Echols verbals to Cal … Who’s Next? One visit and Zion Echols was hooked. Echols is the latest in a bumper crop of college football prospects to announce his college destination. Earlier this month, Glendora quarterback Matt Fink gave a verbal commit to USC. And the Bishop Amat tandem of Trevon Sidney and Tyler Vaughns are still undecided. Echols has been a Tribune All-Area selection the past two seasons. Last year, he rushed for 1,141 yards and 18 touchdowns. He also had 44 receptions for 553 yards and six touchdowns. Zion, I am so proud of you! You are an amazing and inspiring young man and I feel blessed to call you my son! You set your goals, did the work and your dreams are coming true. Even along the way when things got interesting and my faith faltered, it was you who reassured me that it was just part of the Journey, thank you for that. My wish for you moving forward, is to continue Through Love, to Create and Manifest your Destiny, Congratulations Son!! Nothing wrong with being a proud Momma! Congrats to this young man! No need for forgiveness , be proud as your son has done a very good job of reaching goal . May he have continued success at the college level and pursue his athletic and academic dreams and finish his career at CO safe and sound . Good Luck !!!! Great post Momma Echols! You should be very proud. Zion’s a great kid! Congratulations I am really proud of you!